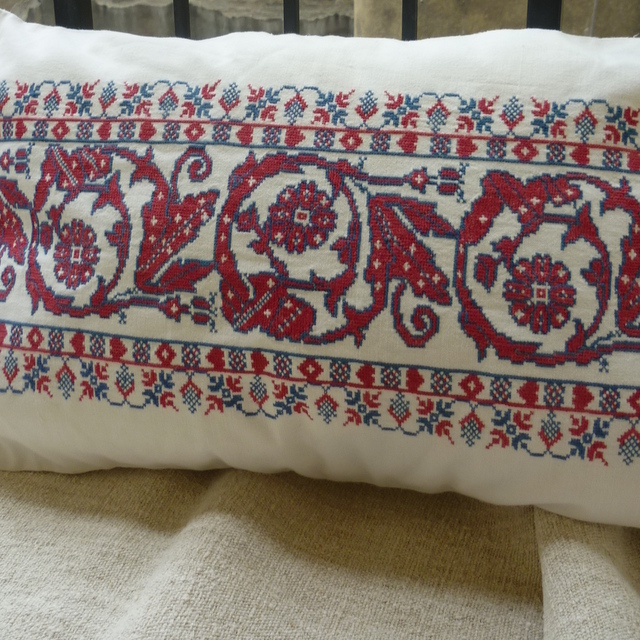 Cushion cover from antique Transylvanian embroidery. Faded red and blue fine counted cross stitch.on fine linen. We have made it into a bolster cushion. Backed with vintage linen, wooden button closure. This style of embroidery comes from a small number of villages in an area near the Maros river in Transylvania. Fine cross stitch on close weave cotton. Each stitch require counting threads of the backing fabric. This piece would have taken weeks or months to embroider.